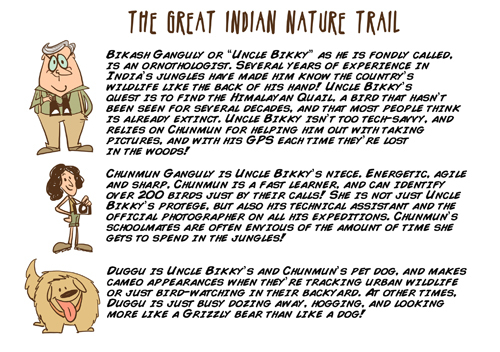 Launching a brand new series of comics- The Great Indian Nature Trail with Uncle Bikky, on WWF's new digital education platform, One Planet Academy! The comics follow the adventures of an ornithologist Uncle Bikky, his wildlife photographer niece Chunmun, and their pet dog Duggu. The characters are inspired by my close friends Bikram Grewal, Munmun Dhalaria and Doginder Singh (who are real-life ornithologist, film-maker and dog respectively!). In each of the stories, the trio heads to a new place in India, and has thrilling encounters with wild animals. Every comic also comes with a quiz, which can earn you points if answered correctly! Log in to http://academy.wwfindia.org/ to read the month's comic, and follow the series to find out whether Uncle Bikky succeeds in finding the Himalayan Quail or not! Hi, do you also have print copy of this series. Not yet, but we are also working on a print edition which will be out next year. WOw! Wanna read this !